The intervals aren’t classical 95% intervals–they’re some kind of fancy estimation from the CDC that you’ll have to click the link to find out about. The hollow points/dashed lines are the “modeled” estimates, and the black points/solid lines are the “direct estimates”. The points are in order according to the modeled estimates. The nice thing about displaying this graphically is that you can see how much uncertainty there is on some of these estimates, so you get a better idea of what this graph does and does not tell you. 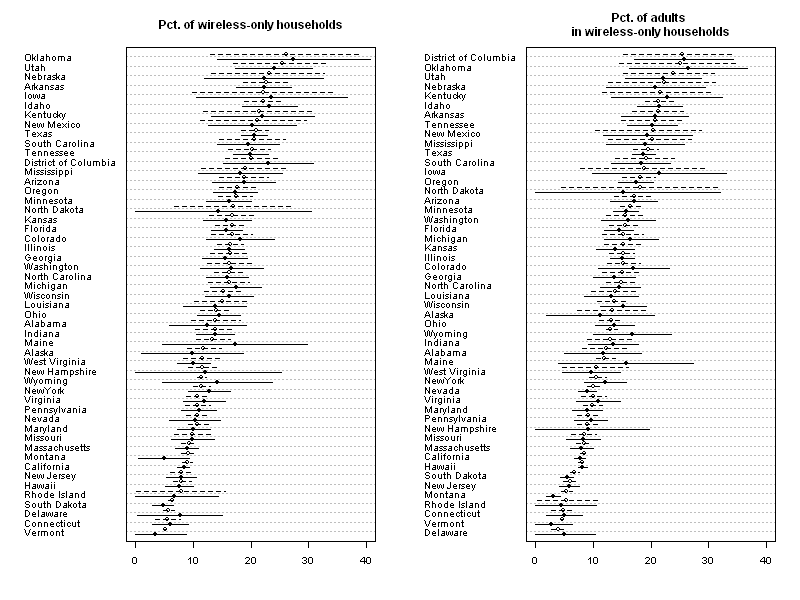 For example, Washington DC is estimated to have the highest percentage of adults in cell-only households, but the confidence intervals reveal that this doesn’t really mean anything–the most you can say is that DC is on the high end of cell-only prevalence.